I had a little visitor at my house yesterday, while Doug and Isaac were at therapy. Of course, he did not come by himself. His mommy, Joy of Case Crossings, brought him over. 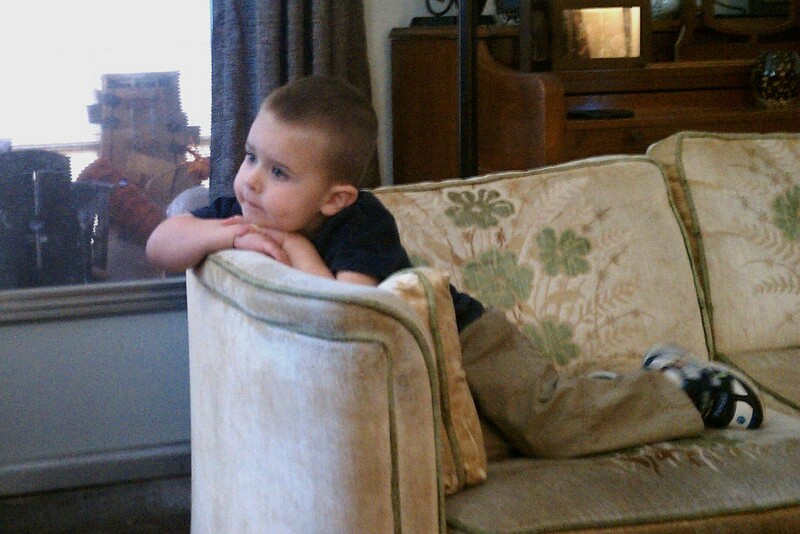 This little man, J, is my first cousin, twice removed. And yes, I DID have to look that up!!! Joy is my first cousin, once removed. Her father and I share grandparents. :) It's interesting how that all works, I think. J had a fun time at my house. Isaac's toys were interesting, the videos and "dbds" (as he calls them) were amazing, and Poppet the bird was exciting! Well, "mesmerizing" might be a bit of an overstatement – the above pose only lasted about 20 seconds before he was off to explore other regions of the house. I just love this age! Everything is NEW! The most common object can bring them utter delight. They want to know everything right now, too! It's so exciting! Yep, my cousinly company was super fun! Can't wait to do it again! I firmly believe that Family makes the best Friends! Thank you, Lord, for the wonderful family you have blessed me with…may I never take them for granted.